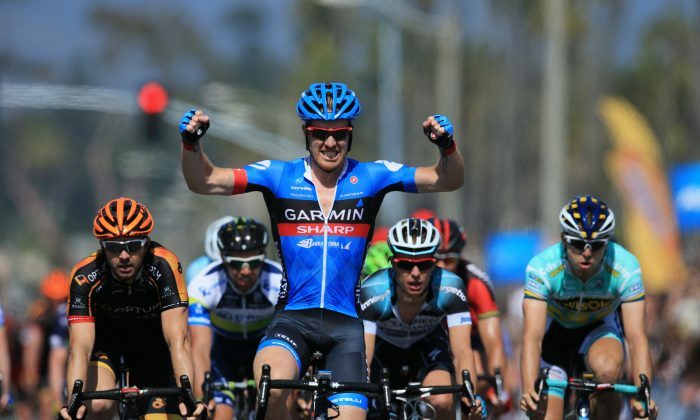 Tyler Farrar, sprinter for the California-based Garmin-Sharp team, had never won a stage in the Amgen Tour of California when he rolled away at the start of Stage Four. Four hours later he was raising both arms in the air as he crossed the finish line first, ahead of Ken Hansen of Optum, Gianni Meersman of Omega Pharma Quickstep, and most important, Cannondale’s wunderkind Peter Sagan, who finished fifth. Farrar had tried following Sagan the day before but got caught in traffic. In stage four he made sure he had a route to the front by starting his sprint before anyone else. The 28-year-old from Washington state had won stages in the Giro d’Italia, the Vuelta a España, and in the U.S. in the USA Pro Cycling Challenge and Tours of Utah and Gila, but had never succeeded in the Tour of California. After coming close the day before, his team mates wanted to be certain they gave him the best possible chance in Stage Four. The Garmin squad massed up front ten km from the finish, and took over the peloton four km out. Garmin couldn’t maintain control; too many teams wanted the stage win. Optum and Orica-GreenEdge (whose sprinter, Michael Matthews, had lost in the last fifteen feet to Sagan the day before,) had the best organization is a disorganized run-in, after a late attack by Matt Brammeier of Champion System was shut down at 800 meters. Optum got a good run down the right-hand barrier, while Omega’s Gianni Meersmanhad to make his own way; he had only one team mate, World Champion Sylvain Chavanel, to guide him through the confusion. Farrar, refusing to get boxed in again, launched early out of the middle of the pack and opened a gap immediately. Hansen and Meersman tried to respond but the Garmin rider had the best legs. Peter Sagan, several riders back, tried to charge down the left side to steal the win at the line again but he was just too late and too far away. The Cannondale rider have been the victim of his own aggressiveness. Sagan had worked hard to chase down a break by RadioShack-Leopard’s Jens Voigt in the final 13 kilometers. Sagan worked hard for 2500 meters to catch a break which in retrospect didn’t have a chance of succeeding. Possibly the energy he spent theire would have been more effectively applied at the finish line. After the scorching temperatures of the first days, the weather for Stage Four was a cool 66 degrees, with a 15 mph wind. The day’s two climbs, Cat Four and a Cat Three, were exponentially easier than they would have been in the hundred-degree weather of the first two stages, and the sprinters’ team were determined to seize the day—particularly Cannondale, whose rider Peter Sagan had already won eight stages in the previous two Tours of California, and also Stage Three the day before. Stage Four was short—135 km—with two relatively easy climbs. It looked like a sprinters’ stage and it was. That didn’t stop riders from forming breakaways. Beyer, Kevin Pipp and Brown (Bontrager got away first, followed by, then three more followed as Bissell sent a second rider ahead to steal King of the Mountains points from 5-Hours’ James Stemper, hoping to keep their rider Carter Jones in the climber’s jersey for another day. Stemper, second in KOM points, needed to win each of the day’s two categorized climbs; Baldwin and Pipp hoped to crest the climbs first. James Baldwin attacked just before the crest of the first climb with Marsh Cooper on his wheel; Stemper was relegated to third, ending his chances of taking the King of the Mountains jersey in Stage Four. Bontrager’s Nathan Brown attacked ahead of the second crest, the Cat Three Casitas Pass, taking the points there, with Baldwin second and Pipp third, denying Stemper any points at all. Pipp fell off after the crest, leaving the other five to press on. The breakaway started to unravel 20 km from the finish line, and 15 km out, Nathan Brown decided to time-trial to the finish. He had some success, stretching the gap to the peloton from 14 to 45 seconds in three kilometers of riding. Jesn Voigt of RadioShack spoiled everything by launching his own attack from the peloton 12.8 km from the finish. United HealthCare’s Lucas Euser and Cannondale’s Peter Sagan immediately went after the German rider, and the rest of the peloton picked up the pace to follow. Voigt, who won Stage Four of the 2012 USA Pro Cycling Challenge with a 136-km solo attack, cannot generally be discounted as a threat but in this case, with the peloton right on his heels and so few kilometers remaining, he really didn’t have a chance. Nathan Brown got caught by Voigt and the pursuing peloton, ending the Bontrager’s rider’s bid for glory. Shortly after Voigt was caught, NetApp’s José Joao Pimenta Costa Mendes launched an attack which lasted 1500 meters. Another NetApp rider tried to attack, but it was gruppo compatto into the final eight kilometers. The field stayed together until it hit a roundabout 2500 meters from the finish, where Champion System’s Matt Brammeier took the shorter route around and gained a gap on the field. He stayed away under the flame rouge and for another 200 meters before being swept up by the peloton. Stage Five: Another for the Sprinters? Stage Five, 186 km from Santa Barbara to Avila Beach, might well be another one for the sprinters. The stage contains only one categorized climb, the Cat Two San Marcos Pass, 25 km into the stage. Certainly the sprinters will drop back on this climb, and toil up in a gruppetto (or alternately, autobus) while the lighter climbers will reach the summit easily. There will still be 150 km for the sprinters to recover, catch the peloton, and prepare for another sprint finish. This looks like a good stage for another win by Peter Sagan. Or not. There are a lot of uncategorized climbs in the stage, not steep enough to be named and numbered but enough to exhaust the sprinters. If there is a sprint, the sprinters will have to negotiate three turns in the final 1000 meters including a narrow left-hand bend and contend with a slight rise in the final 300 meters. Almost certainly a breakaway will attack on the San Marco climb, if one hasn’t already. Even if some riders have gotten clear of the peloton before the climb, a smaller group might attack on the climb or the descent. If the peloton has to chase hard, the sprinters might be too tired at the finish, opening the field for a lot of strong riders who are not necessarily sprint specialists. A series of small hills starting 30 km from the finish might serve as a launching pad for another escape attempt. Look for the U.S.-based Continental teams to try to steal the stage in the final 30 kms.